“When I grow up, I will be brave enough to fight the creatures that you have to fight beneath the bed each night to be a grown-up"
Darn it darn it darn it. 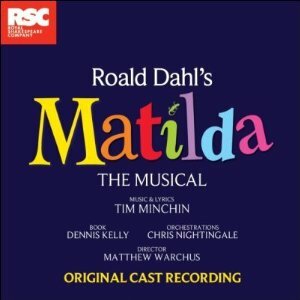 I had pretty much decided that I wasn’t going to go and see Matilda the Musical once it had made its long-awaited West End transfer from the now-defunct Courtyard in Stratford to the Cambridge Theatre. Not because I didn’t like it, I really did (though not quite as much as others) - you can read my thoughts here - but because of the eye-watering ticket prices: the vast majority of the stalls and dress circle are £60 or more, rear stalls coming in at a mere £50. 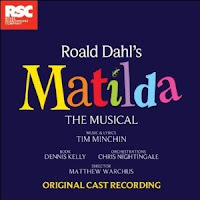 That pretty much made up my mind for me but on purchasing the original cast recording which has now been released on CD, I have fallen well and truly back under the spell of this show and so it looks like I will have to do some careful budgeting next month! When it was first announced, the marriage of individual Australian comic Tim Minchin with Roald Dahl’s source material seemed the ideal match but I don’t think anyone could have imagined just how well it would work. The score is simply joyous, the lyrics perfectly crafted – witty enough to make adults laugh and carefree enough to perfectly evoke childhood thinking and the combined package fits together in a way that one imagines that Roald Dahl would be proud of. Chris Nightingale’s full-bodied orchestrations give depth to the music, especially in the swirling sections of incidental music that are included (that’s probably my one criticism is that not enough of that is kept in here) and an enthusiastic cast give marvellous voice to these quirky but perfectly suited songs that will undoubtedly leave a smile on your face. Whether it is the joyous swells of Miracle or the alphabet fun of School Song or the raucous precocity of Revolting Children (which I swear is just Prozac in musical form! ), the songs mainly featuring the kids are just delightful, though it would have been nice to have an edited version of Miracle without the interludes. The brash comic villainry of the Wormwoods is served well in both Josie Walker’s Loud and Paul Kaye’s Telly, huge amounts of fun alike and their monstrosity blunted a little by the humour in their material and counterpointed beautifully by the sweet tones of Lauren Ward as Miss Honey. Miss Trunchbull remains a figure of terror though, Bertie Carvel's vocal performance is just chilling – if you ever hear ‘Ad infini-TUM!’ again without flinching, you’re braver than I.
Minchin also carefully manages to avoid being cute or twee which is an achievement in itself, the delicacy of songs like Quiet and My House are underscored with a powerful emotional truth: though it is a little girl singing Quiet, the feelings of insecurity, of feeling a bit different to everyone else, is rooted in a recognisable reality, made all the more devastating by the astonishing maturity of the singing: all three Matildas from Stratford share the vocals on the recording - Adrianna Bertola, Josie Griffiths and Kerry Ingram all doing incredible work (it’s a little sad that only Ingram is making the journey down with the transfer). And then there’s When I Grow Up: a simply gorgeous tune and all the more so for the visual that anyone who has seen the show will have in their head, I won’t spoil it here but it really is a magical moment of theatre. It was interesting to revisit the show in this way, really focusing on the lyrics and looking again the things that had niggled me first time round and seeing how well most of them actually work. It just goes to show how much I had unwittingly carried preconceived notions of how the transfer from page to stage should have been done, the change of emphasis from her magical powers to her storytelling gift disappointing the child in me a little but here, listening to her tales accompanied by the stirring music, it really does work. So I’ve a lesson to learn but I still don’t think I could ever watch a version of George’s Marvellous Medicine that would live up to my childhood memory though as the description of the mixing in that book was one of my absolute favourite pieces of writing, one I would constantly re-read. So there you have it, this is as good a CD as you will buy this year in any genre, never mind musical theatre. I know not everyone thinks that musicals are their thing but this score – and show – taps into such elemental truths, of being a kid, of learning to accept who you are, of love, that you really would have to have a heart of stone not to fall in love with it. Book for the show (and take me with you) and then buy the CD after, you won’t regret it. If you can only download one song, make it...well it ought to be the whole album no excuses, but it is When I Grow Up that edges Quiet as my top tune.